The Missouri DOT TAMP is available here. 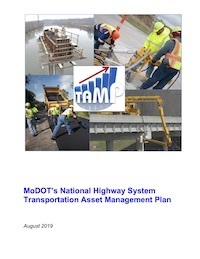 Missouri DOT's Transportation Asset Management Plan demonstrates the linkages between maintenance and planning efforts, and it documents Missouri DOT's financial planning, risk management, inspection, and budgeting processes. The plan will also assist Missouri DOT in making decisions about where and when to invest funds in infrastructure improvements. This document includes the following sections: Asset Valuation, Data Management, Financial Plan, Introduction, Inventory and Condition, Investment Strategies, Lifecycle Management, Objectives and Measures, Performance Assessment, Process Improvements, Regulatory and Legislative Requirements, Risk Management.